When a child is given age-appropriate art experiences, it fosters creativity, social, emotional, and physical development. When children are encouraged to experiment with a variety of art materials, they are free to create their own unique masterpieces. Try one of these art activities from some simple-to-do painting projects below designed to inspire children. Remember there is more to painting than just with a paintbrush! Note: Some activities may become messy, so painting smocks and newspapers on the floor are advised. Have soap and water available for easy cleanup. In advance, ask parents to donate all types of brushes. Examples are pastry brushes, makeup brushes, hairbrushes, toothbrushes, shoe brushes, nailbrushes, scrub brushes, and so on. In this activity, children will take part in a tactile and creative experience as they explore this new painting technique. First ask the children if they know about these brushes and what they are used for at school or at home. Pass each brush around the art table naming them as they go around. Encourage the children to feel the bristles and ask them to describe how they feel. Introduce words such as soft, hard, smooth, scratchy, and rough. Tell the children that they are going to paint with these brushes for a new art experience. Pour several colors of paint into separate containers. Demonstrate how to put a brush into the paint and then paint with it on paper. Invite them to try several of the brushes on their paper and describe the design each one makes. Ask the children if they enjoyed this new painting experience. Children can have fun creating art with balls in a variety of sizes. Gather balls such as small rubber, golf, ping-pong, tennis, wiffle, and Nerf. Pour some paint onto paper plates. Invite the children to drip the ball into the paint and then dab it onto their paper. Ask if they can tell which ball made each design. For a class project, roll out butcher paper across a table. Have a child on either side. Load the paint onto the balls and roll them across the table. Invite the children to dip, dunk, and drag string to experience a new way of creating colorful paintings. Attach a spring-type clothespin to each length of string. Yarn or ribbon can be used as well. Show each child how to drag the string through the container of paint and pull the string across white paper to make interesting designs. Give the children plenty of time with this project to experiment with the technique of dunking and dragging. Use the words “back and forth” and “round and round” to describe the movements that are made with string painting. Challenge the children with this project by asking them to use two strings at a time. Present two primary colors of paint and see what happens when these strings drag together to make another color. This begins a lesson on color-mixing. There are many ways to use paint in the classroom. 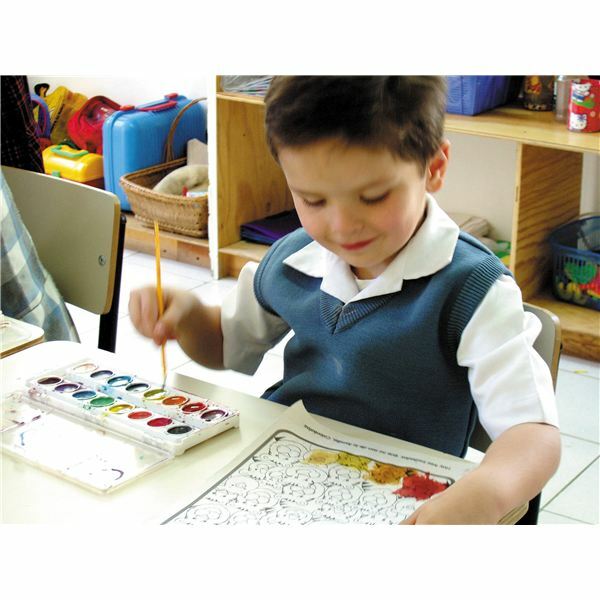 As you plan a preschool paint activity such as these open-ended projects, the children will enjoy the experience socially as they develop their eye-hand coordination and small motor skills as well. This article has only touched on a few painting techniques for preschoolers, but don’t forget about other techniques such as fingerpainting, sponge painting and even painting with spaghetti.